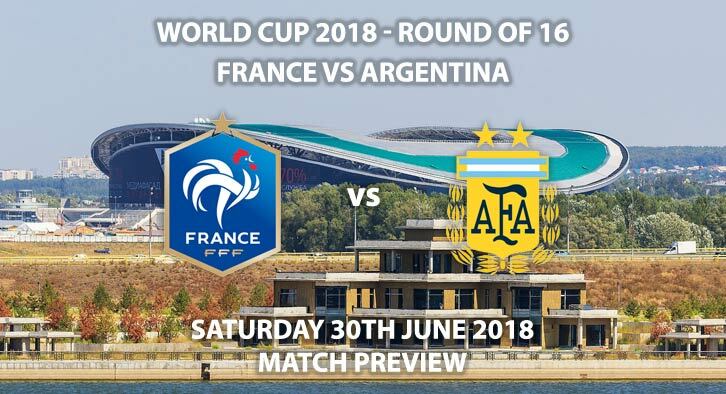 France vs Argentina – the French meet Argentina in the first knockout game of the World Cup with both sides desperate to earn a place in the last eight of the competition. With both teams needing a point, France played out a drab goalless draw with Denmark to ensure top spot in Group C. Didier Deschamps opted to make several changes for that game, resting Kylian Mbappe, Paul Pogba and Hugo Lloris. However, given France’s embarrassment of riches with their squad, they should have produced a much better performance. France are still yet to impress in Russia despite remaining unbeaten. Despite their undoubted individual quality, we are yet to see a cohesive, fluent performance. It is a task that many have struggled with in recent years. Belgium, previous to this tournament, have had the same problem. How do you get the best out of such a fantastic group of players? How do you fit them all in? One player who has looked his usual self is Ngolo Kante. He has become one of France’s most important players in central midfield. He will be vital to their hopes of moving into the quarter-finals. Lionel Messi’s first goal of the World Cup coincided with Argentina’s first win. Their 2-1 victory over Nigeria was enough to smuggle them into the last 16, on goal difference. After seriously disappointing in the first two games it was a much-improved performance from them, although they still left plenty to be desired. There is no getting away from the fact this is one of Argentina’s worst sides in years. Messi aside, they are desperately poor, especially in defence and midfield. Although Ever Banega’s inclusion added some creativity in midfield, they have looked desperately lacking in the middle of the park. That has forced Messi deeper, making him less of a goal threat. Alireza Faghani is the referee for Saturday’s game. He is a referee with international pedigree, having refereed the finals of the 2014 AFC Champions League, 2015 AFC Asian Cup, 2015 Club World Cup and the 2016 Olympics. The Iranian official averages 4.4 cards per game and therefore I’d advise a maximum booking points total of 40+. Neither of these two sides have set the tournament alight so far. Argentina were very fortunate to even make it this far but they do have Messi. France need to improve; a better performance from them should see them win this game. With only six goals in six between the two team, I think this will be a game settled by fine margins, but I am siding with France. France vs Argentina is televised in the UK live on BBC 1 with kick off at 15:00. France to win by exactly one goal – 11/4. France win 2-1 – 10/1. 1st Goalscorer – Antoinee Griezmann – 11/2. Anytime Goalscorer – Lionel Messi – 6/4. RequestABet Specials Up to 10/1 – Over 1.5 goals, Griezmann & Messi 1+ Shots on Target each, 3+ corners each team and 10+ booking points each team – 7/2. (NAP). RequestABet Specials 80/1 and above – Draw 0-0, and no booking points – 200/1. (0.25pt Outsider). Giroud to score a header and Messi to score from outside the area – 125/1. (0.25pt Outsider). Tips updated at 11:25 GMT on 30th June 2018. Markets will not be updated again prior to the game kicking off.